Triple G and Canelo gave the people what they wanted – a great fight. But, unfortunately, the great fight is going to be lost in the discussion because of the controversial decision. The judges scored the fight 118-110 Canelo, 115-113 Golovkin and 114-114 draw. If you watched the fight, this is a horrible decision. Adalaide Byrd was the controversial judge that scored the match 118-110 – she must have watched the beginning, fell asleep and woke up for the last two rounds. That’s the only explanation for that score. It is ridiculous. The fight was good, GGG walked at Canelo from the third round till the bell rang after the 12th round. He was aggressive, although he never landed his trademark knock-them-out punch, he was scoring all night. He won. Boxing wonders why it has a reputation of corruption? This fight combined with the Pacquiao-Horn fight just shows you that it is corrupt, which is sad. 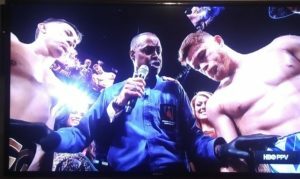 Triple G needed the knockout to prevent this controversy because the money is on Canelo’s side and unfortunately, the money won again tonight. But needing a knockout and not getting it, doesn’t mean he didn’t win. You shouldn’t need a knockout to win. At least it was a draw and he keeps his belts. Cinco De Mayo is a Saturday in 2018. You can book the rematch. And Triple G will have to approach this match understanding he needs the knockout and that might play into Canelo’s hands. I predicted GGG to win tonight (which he did) and I’m going to take him again in the rematch.